Biletnikoff caught 57 passes for 987 yards and 11 touchdowns as a college senior and added another 13 receptions for 192 yards and four TDs in the Gator Bowl. He was chosen in the second round of the 1965 AFL draft by the Raiders (and in the third round of the NFL draft by the Detroit Lions) and moved into the starting lineup at midseason. A quiet second season was followed by a breakout year in 1967 in which Biletnikoff had 40 catches for 876 yards (21.9 avg.) and was named to the AFL All-Star Game. He followed up with 61 receptions for a career-high 1037 yards (17.0 avg.) and six TDs in ’68. Raiders went 12-1-1 to finish first in the AFL Western Division while leading the league in total yards (5036), passing yards (3271), touchdowns (45), and scoring (377 points). Won AFL Divisional playoff over Houston Oilers (56-7). Lost AFL Championship to Kansas City Chiefs (17-7). 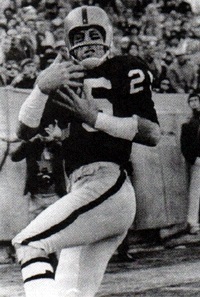 Biletnikoff spent another nine seasons with the Raiders. Lacking great speed and with a slight build, he had excellent hands (often covered with “stickum”) and a knack for getting open, and he was highly consistent, catching 40 or more passes 10 times. Biletnikoff led the NFL with 61 pass receptions in 1971 and was named to two AFL All-Star Games, four Pro Bowls, received at least some All-AFL or All-NFL honors after five seasons, and was the MVP of Super Bowl XI following the 1976 season. Overall with the Raiders, he caught 589 passes, the fourth most in league history at the time, for 8974 yards (15.2 avg.) and 76 touchdowns. He held NFL postseason records at the time of his retirement with 70 receptions for 1167 yards (16.7 avg.) and 10 TDs. Biletnikoff spent one final season (1979) in the CFL with the Montreal Alouettes and capped his pro career with 38 catches for 470 yards and four TDs. He was inducted into the Pro Football Hall of Fame, Class of 1988.